Roger and Sharon Hornbeck were married in 1974 and love living life together! 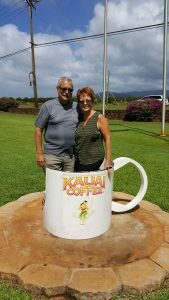 They thoroughly enjoy their four adult children and spouses, and their amazing nine grandchildren! They also care for two intellectually disabled adult women who have lived with them since 2002. Roger and Sharon have served as pastors since 1980 and currently reside in the greater Phoenix, Arizona area where Roger is Pastor of Discipleship at Pure Heart Church (www.pureheart.org). Sharon and Roger are members of the ESDA (Evangelical Spiritual Directors Association) and the SFSAZ (Spiritual Formation Society of Arizona). Roger has a Master of Divinity from Western Seminary and is trained as a Spiritual Director from Selah, a Certificate Program from Leadership Transformation. https://www.leadershiptransformations.org/selah.htm. Roger is available for Spiritual Direction, Spiritual Formation Coaching, and Ignatian Spirituality Accompaniment (Ignatius of Loyola). I have had the honor of being shaped by rich and diverse Christian influences. I am forever indebted to my Baptist roots for giving me a lifelong love for the inspired Word of God; the Vineyard teaching that has awakened me to a living, active God and the power of prayer; and, a love for the deep historic roots of liturgical traditions. I love to walk with individuals as they seek a deeper relationship with God, becoming more like Jesus for the sake of others. Sharon has extensive experience in teaching Bible Study methods, retreat speaking and planning, as well as individual counseling, mentoring, and coaching. Sharon has been trained as a Spiritual Director from Sustainable Faith. 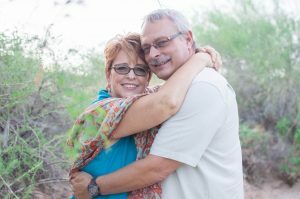 http://www.sustainablefaith.com/school-spiritualdirection/ Sharon is also a member of the Arizona Enneagram Association and has received Advanced Training in the Immanuel Approach to Prayer. She is available to accompany fellow sojourners in Spiritual Direction, Spiritual Formation Coaching, in the Enneagram (a personality profile system), in Immanuel Prayer (healing prayer), and in the Ignatian Spiritual Exercises (Ignatius of Loyola). I am passionate about helping others journey deeper in their walk with God and I love to help them discover their own unique way to do that. I believe in an eclectic style of resources and venues to aid in experiencing a loving and present God. Our journey together has taken us to several different states—Oregon, Washington, California, and Arizona—and we have been blessed with a wealth of memories and an abundance of friendships. We’ve been in small, rural areas and in large cities. Currently, we live in the greater Phoenix area and love the warm weather, the beautiful blue skies, and the always-amazing Arizona sunsets! Our two sons live in Seattle, as does one of our grandchildren. A daughter lives in Austin, along with her husband and five children. Another daughter and her three children live in Phoenix, also. Anyone who is a grandparent knows the joys of grandchildren and one of our greatest delights is being with them as often as possible! We enjoy outd oor activities, such as kayaking, biking, and swimming, along with quiet days of reading, napping, and playing games. Sharon has an extensive teacup collection and is always up for a tea party with friends or loved ones (the granddaughters especially enjoy them!). 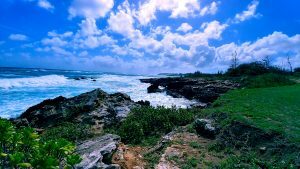 In 2004, we discovered the beautiful island of Kauai and have claimed it as our own! It is our pleasure to return there every fall and soak in the island aloha! I gave my life to Jesus at the age of five and never regretted it. As a young child, I loved God and wanted to serve Him. Raised in the Baptist church, I learned to love the Word of God and look to it for everything I needed pertaining to life and godliness. In the 1980’s, Roger and I began to discover liturgical disciplines that aided in our walk with God and we slowly incorporated them into our spiritual practices. Reading books on spiritual formation and Kingdom theology has greatly impacted how we view our world and our call. Everyone accumulates baggage as we move through life, and I am no different. Family-of-origin, personality bent, choices, and life circumstances have shaped me just as they have shaped everyone. While the spiritual practices gave structure to my life, the deepest and most profound healing in my heart happened when I entered training to become a Spiritual Director. There, I discovered a more contemplative way which allowed God to begin the deep and gentle work of caring for my soul. I awakened to the love of God in a way I had never experienced before, and it has forever changed my life. I am becoming my True Self! Because of the gratitude for the great gift I have received, I welcome opportunities to help others be transformed by God’s loving embrace. It would be a privilege to journey with you! I was raised in the church and went forward to be baptized when I was 8. At ten, we moved to a new town and a new church. Something inside told me my choice at eight was not finished, and so, to the best of my understanding, I asked to be baptized again. However, God stayed in a corner while I engaged the Beatles, skateboards, and girls—leaving God at the church on Sunday. At the beginning of the summer before entering High School, Rex came as a summer youth worker. For some reason, he invited me to be with him. Rex taught me to study the Bible, read Christian books and shine my shoes (before Converse became my shoe of choice). That summer with Rex changed my life, changed my perspective on church and has become the bedrock of my ministry. I have been shaped by numerous Christian traditions and movements. The 1960’s Jesus People modeled a raw on-the-street commitment to Jesus. The Baptists gave me a love of the Bible. The charismatics opened my eyes to the Presence and Power of God now. The liturgical traditions have rooted me in the long history of Christ followers and what they learned. Today, these streams have come together in my longing to become like Jesus for the sake of others. To live into this reality, I value all the spiritual habits (disciplines) modeled throughout the Church as providing the space to meet with God’s transformation presence. I accept that becoming like Jesus involves the formation of my whole self into His image, and I embrace His invitation to build His Kingdom one person at a time. For nearly four decades, I have had the honor of being a companion with others on the same journey. If you would like to explore meeting with either Sharon or Roger, fill out the Contact Form.